DERA Food Technology UK Ltd is an ingredient-based solutions provider to processed meat, convenience foods and snack manufacturers in the UK and Ireland. We work in partnership with our customers to provide innovative ingredient solutions, drawing on our expertise in ingredient functionality, flavors, culinary ingredients and our understanding of processing requirements. DERA offers innovative solutions for the food industry: functional ingredients, ingredient blends, spices, seasonings, and in some countries packaging material and equipment. DERA is active in more than 30 countries. After reviewing numerous internal processes, DERA recognized its need to update its web based CRM process for its constantly expanding product lines and market segments. The existing order entry process was time-consuming and outdated, involving a legacy Access based database that was not only slow but prone to freeze attacks and data corruption. The company needed to find a more agile solution with the capacity to handle order entry and numerous customer service issues quickly and accurately. They also wanted a system that would empower their sales people to be more effective on the field. The Access database based system meant that if you are not in the office you simply did not have the information and it took countless calls to process the sales enquires. In short, DERA found significant shortfalls in the information available from its old business system. The company wanted to streamline its web based CRM process to increase turnover, grow its market share, and ultimately, increase profit. 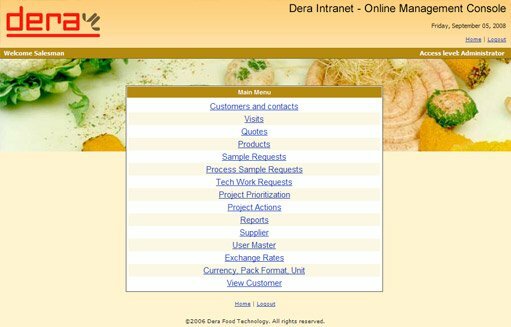 “We need a CRM solution that works to our advantage and is future proof” said, Peter Cooper, Partner DERA Food Technology, UK. A web based application that syncs data from the legacy systems into a new database management system that’s fast and scalable. The online system is not only used by Salesmen through their laptops they also use mobile devices to extract relevant information quickly. A powerful customer support module lets the salesmen log problems, analyze trends, check status on orders and track projects interactively. A project management system has made it a lot simpler for the clients, salesmen and the manufacturing to coordinate their efforts for the best possible results. Information is saved on the legacy backend with an ASP.Net based front-end which runs on an internally hosted web server. The application is protected by a powerful security and auditing system ensuring complete accountability and security of the data. We routinely work with Dera salesmen to enhance and tweak the offering as the company’s business model goes through a change. Salesman fully connected while on the move!! DERA has now outfitted its sales force with smart phones and their operations have never run more efficiently. The implementation has dramatically improved the DERA customer service and project entry processes. They can now offer customers instant tracking information about their projects and dissipate vital sales data to the salesmen in real time. Dera Principles now focus on their core competence and let the technology work for them.